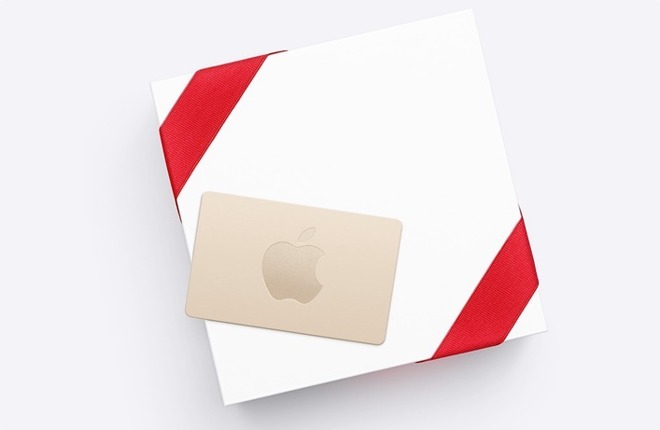 Described on both the Australia and New Zealand Apple websites as a "One-day shopping event," visitors are advised they can receive a gift card worth up to NZ$210 ($144) or A$210 ($160) with the purchase of "selected Apple gifts." According to the terms and conditions, customers are limited to a maximum of two gift cards under the promotion, making the maximum combined value of gift cards attainable in the offer NZ$420 ($289) or A$420 ($320) for each respective region. An examination of the gift card distribution between the two regional stores indicates the gift cards are being offered with the same numerical denomination for the selected items, but under each of the two currencies. For example, a product offering a A$70 ($53) gift card in Australia will provide a NZ$70 ($48) gift card in New Zealand. New Mac purchases, including the MacBook, MacBook Air, MacBook Pro, iMac, and Mac Pro will include an A$210 gift card, regardless of model and configuration. The notable exclusion to the list is the Mac mini, which does not provide any gift card at all to customers. The iPhone 7, iPhone 6S, and iPhone SE will net customers a A$70 gift card, with the same value also provided to corresponding Plus models. The iPhone 8, iPhone 8 Plus, and iPhone X are absent from the offer, presumably due to their relatively recent launches and low availability, among other potential reasons. For iPads, buyers of the 10.5-inch and 12.9-inch models of iPad Pro will receive the A$140 ($106) gift card. Sales of both the iPad and iPad mini 4 will gain customers a A$70 gift card. Lastly, two models of the Apple Watch Series 1 are being offered alongside a A$35 ($27) gift card, with the selection including the Space Grey Aluminum Case with Black Sport Band and the Silver Aluminum Case with the White Sport Band. Newer Apple Watch models are not included in the offer. The Apple retail and online sales in Australia and New Zealand strongly hint at the similar offers Apple will provide in other regions for Black Friday, including the United States. Aside from some small product tweaks and changes in currency, it is unlikely for there to be any major differences between regional offers when they become available. As many retailers offer considerable discounts and bonuses with their products, it may be worth looking at other Apple authorized resellers during Black Friday for potentially better savings, including exclusive coupon offers, aggressive discounts, free shipping, and no tax in some states. AppleInsider highlights some of the better deals on offer in our Black Friday deal roundup, while our Price Guides are updated daily with the lowest prices on Apple products.